Posted on August 15, 2018 by Andy Higgs in Home. Mount Fuji is easily one of the most iconic sites in Japan, and not only a geographical point but a cultural symbol for the country. Although the unmistakable peak can be spotted from a variety of locations, each vantage point offers its own special view of the often snowy top. Mount Fuji and is easily accessible for tourists and can be enjoyed from the base of the mountain or from a variety of viewpoints. Whether it is viewed from the windows of the bullet train, the serene ’Five Lakes’ region surrounding it or even from the city of Tokyo, the view can be enjoyed by all types of travellers. One way is to take tours from Tokyo to Mount Fuji in order to enjoy some of the highlights of the region. The mountain is also perfect for the selfie lovers among us with its beautiful slopes and views. Public WiFi is available across the entire mountain and can even be used with a Japanese VPN for the privacy-conscious. So remember to upload your best shots to Instagram and Facebook. 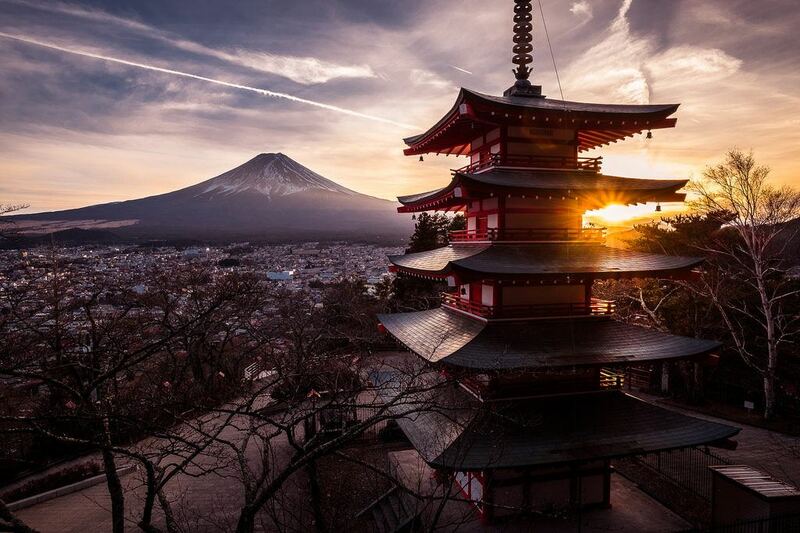 Along with Mount Haku and Mount Tate, Mount Fuji is highly regarded as one of the Three Holy Mountains. According to Japanese tradition, the three mountains are believed to house spirits and gods are sacredly respected this way, since ancient times. The characteristics of the mountains are also spiritual and symbolic. Visiting them is an important way to connect to Japanese culture and tradition and feel the sacred elements. Artistic interpretations can be seen in both the past and present. The emblematic peak has appeared in ancient texts and art pieces and continues to be portrayed in modern art exhibits and works. One of the most famous artworks The Great Wave at Kanagawa by Katsushika Hokusai has been noted for making this Japanese viewpoint recognizable across the world. Regardless of hiking abilities, climbing Mount Fuji is a powerful experience. Climbing season falls during the summer months of July and August and sometimes into mid- September depending on the climate. The peak is some 3776 meters high and is known to give altitude sickness and takes an average of six hours to reach the summit. Given that it is a very popular spot for tourists, the hiking paths can be quite crowded with both local and foreign climbers. Whether the intention is to climb, hike or just admire the stunning peak, the region is appealing during all seasons. In fact, based on the time of year, the peak can appear different but regardless it always worth looking at. Mount Fuji is recognized by UNESCO as a world heritage site and is recognized worldwide for its cultural significance as of June 26, 2013. If travelling to Japan in the near future, Mount Fuji will certainly be a focal point while visiting. Some other excellent places to see the peak from include the Fuji Shibazakura Festival, Lake Kawaguchiko and Hakone. ← So what is the best city in Africa, then?